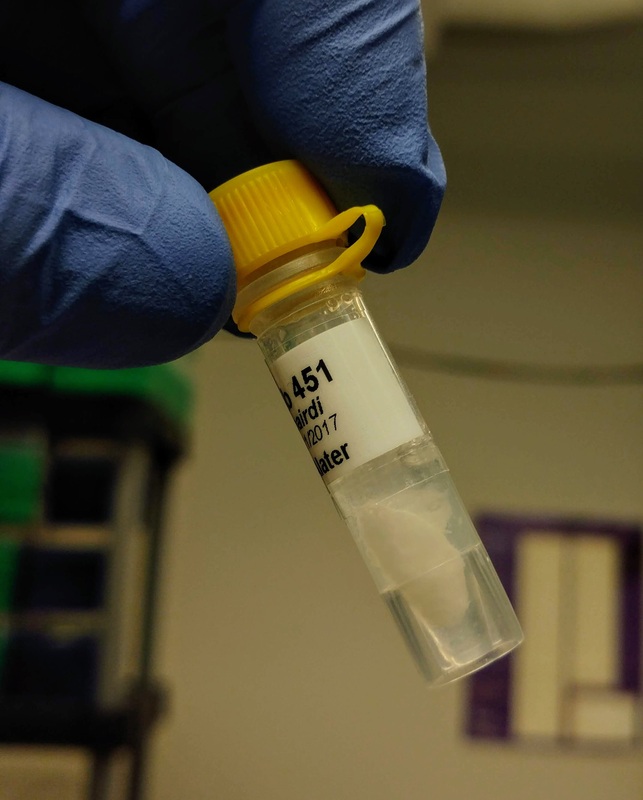 Last Friday, Ronit quantified 1:10 dilutions of the RNA I isolated on 20181003 and the RNA he finished isolating on 20181011, but two of the samples (D11-C, T10-C) were still too concentrated. I made 1:20 dilutions (1uL RNA in 19uL 0.1% DEPC-treated H2O) and quantified them using the Roberts Lab Qubit 3.0, with the RNA HS assay. Used 1uL of the diluted RNA. This entry was posted in Miscellaneous and tagged Crassostrea gigas, ctenidia, D11-C, diploid, Pacific oyster, Qubit 3.0, Qubit RNA HS, RNA, RNA quantification, T10-C, triploid on 16 October, 2018 by kubu4. Added 1mL TriReagent to each tube, vortexed to mix/dissolve solute, incubated 5mins at RT, added 200uL of chloroform, vortexed 15s to mix, incubated at RT for 5mins, centrifuged 15mins, 12,000g, 4oC, transferred aqueous phase to new tube, added 500uL isopropanol to aqueous phase, mixed, incubated at RT for 10mins, centrifuged 8mins, 12,000g, at RT, discarded supernatant, added 1mL 75% ethanol, centrifuged 5mins, 12,000g at RT, discarded supernatant and resuspended in 10uL of 0.1% DEPC-treated H2O. Phase separation after chloroform addition was not particularly good. Aqueous phases in sample 424 was a bit cloudy (salty?) with no defined interphase. The remaining two samples did exhibit a defined interphase and were the aqueous phases were less cloudy than sample 424, but were far from ideal. Quantified RNA using Roberts Lab Qubit 3.0 with the Qubit RNA high sensitivity kit. Used 5uL of each sample. No detectable RNA in any samples. Samples were discarded. As has been the case for all samples in this project, RNA isolation methodologies have produced wildly inconsistent results. This entry was posted in Miscellaneous and tagged Chionoecetes bairdi, Qubit 3.0, Qubit RNA HS, RNA, RNA isolation, RNA quantification, tanner crab, TriReagent on 9 October, 2018 by kubu4. Due to difficulties getting RNA from hemolymph samples stored in RNAlater, Grace is testing out lyophilizing samples before extraction. Who knows what impact this will have on RNA, but it’s worth a shot! 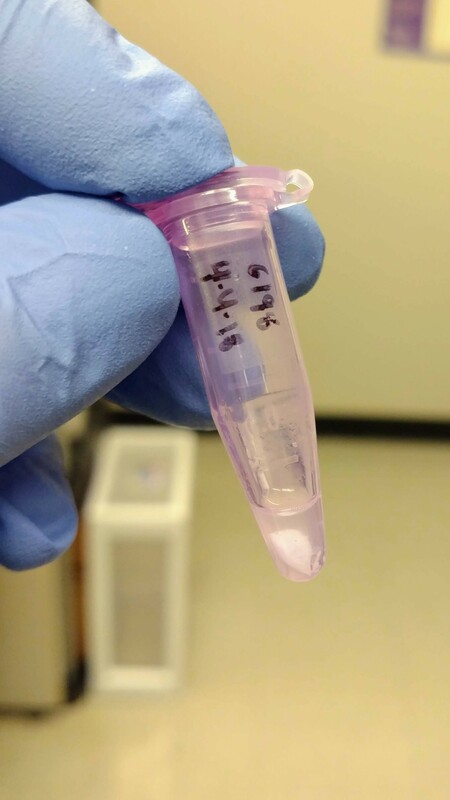 Isolated RNA from three crab hemolymph samples preserved in RNAlater (Test 1, Test 2, Test 3) that had been lyophilized overnight last week. Samples were provided by Grace. I believe the primary purpose for this particular test was to verify that the freeze dryer was a feasible tool, since Grace experienced a minor mishap when she attempted the lyohpilization initially. Lyophilization was successful, without any mess. Only one sample (Test 3) had detectable levels of RNA (20.4ng/uL). So, this little test demonstrates that RNA can be isolated from lyophilized samples and extracted with TriReagent. However, I have not evaluated RNA integrity on the Bioanalyzer. I think Grace has some additional samples she wanted to test this method on, so I think we’ll wait until there are more samples before we use the Bioanalyzer. Will give sample to Grace for -80oC storage. This entry was posted in Miscellaneous and tagged Chionoecetes bairdi, crab, hemolymph, lyophilize, Qubit 3.0, Qubit RNA HS, RNA, RNA isolation, RNAlater, tanner crab on 17 September, 2018 by kubu4. We previously received sea lice (Caligus tape) DNA from Cris Gallardo-Escarate at Universidad de Concepción. Steven asked that I quantify and assess the DNA quality. Ran the samples on the Roberts Lab Qubit 3.0 using the dsDNA BR assay (Invitrogen) and 1uL of template DNA. 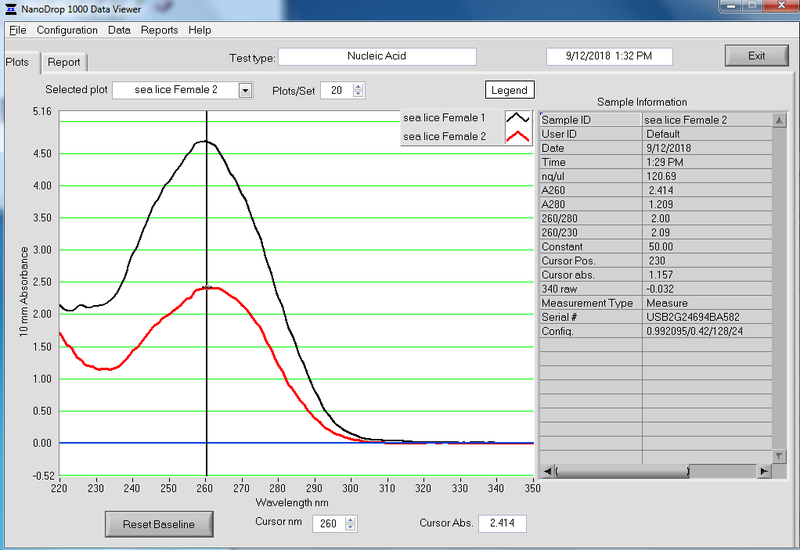 Ran the samples on the Roberts Lab NanoDrop1000 to get 260/280 values for quality assessment using 2uL of template DNA. NanoDrop1000 was blanked with water, but I don’t know what solvent the DNA is currently resuspended in. DNA looks super clean. Not sure what this DNA is intended for so can’t speculate much on what the implications might be for the concentrations on downstream usage. This entry was posted in Miscellaneous and tagged caligus tape, DNA Quantification, NanoDrop1000, Qubit 3.0, Qubit dsDNA BR, sea lice on 12 September, 2018 by kubu4. Added mercaptoethanol (2-ME) to Buffer RLT Plus. RNA was quantified using the Qubit RNA HS (high sensitivity) Assay and run on the Roberts Lab Qubit 3.0. Used 1uL of sample for quantification. 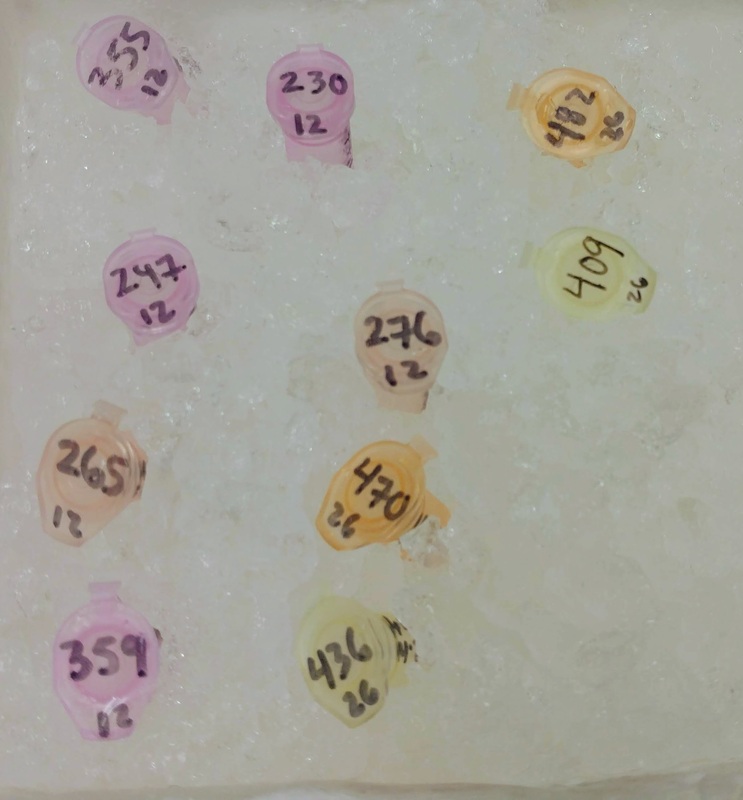 RNA was returned to the -80C box from where original samples had been stored (Rack 2, Row 3, Column 4). Overall, the results aren’t great. Only 15 samples (out of 40) had detectable amounts of RNA. Yields from those 15 samples ranged from 40ng – 300ng, with most landing between 50 – 100ng. Will pass info along to Grace. Will likely meet with her and Steven to discuss plan on how to move forward. This entry was posted in Miscellaneous and tagged Chionoecetes bairdi, hemolymph, Qubit 3.0, Qubit RNA HS, RNA, RNA isolation, RNeasy Plus Micro Kit, tanner crab on 9 August, 2018 by kubu4. 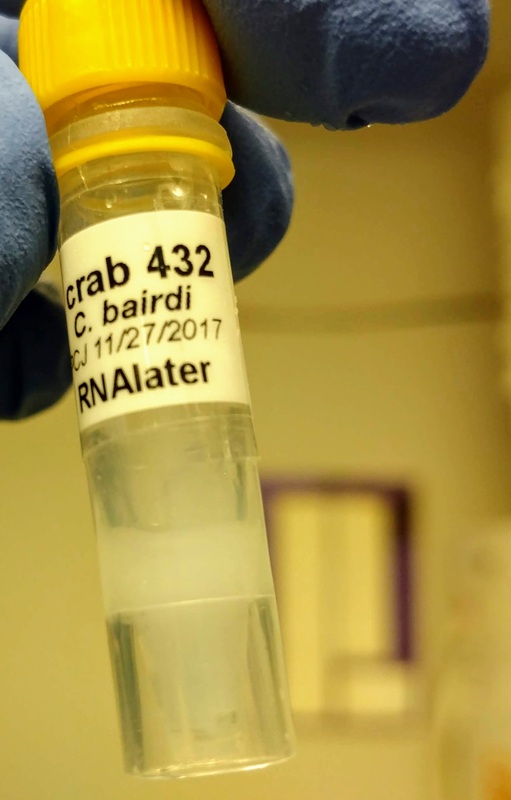 In a continued attempt to figure out what we can do about the tanner crab RNA, Steven tasked me with using an RNeasy Kit to cleanup some existing RNA. Samples were cleaned up using the [RNeasy Plus Mini Kit (Qiagen)]. Added 350uL of Buffer RLT Plus (no beta-mercaptoethanol added) to each sample, vortexed, and then processed according to the manufacturer’s protocol (skipped gDNA Eliminator spin column step). Samples were eluted with 30uL of nuclease-free water. Samples were quantified using the Roberts Lab Qubit 3.0 with the RNA High Sensitivity asssay (Invitrogen). Used 5uL of sample for measurements. Samples were also assessed with the Roberts Lab NandoDrop1000. Samples were recovered from the pedestal after measurement. RNA was given to Grace for storage at -80C. All concentrations were too low for detection via NanoDrop. Qubit quantification indicate yields ranging from ~25ng to ~192.5ng. Will share info with Grace and let her compare these numbers to her original concentrations to see if there’s any differences. Regardless, based on my earlier RNA isolation today, these samples should now be much cleaner and we should be able to trust the Qubit quantifications. This entry was posted in Miscellaneous and tagged Chionoecetes bairdi, NanoDrop1000, Qubit 3.0, Qubit RNA HS, RNA, RNeasy Plus Mini, tanner crab on 31 July, 2018 by kubu4. 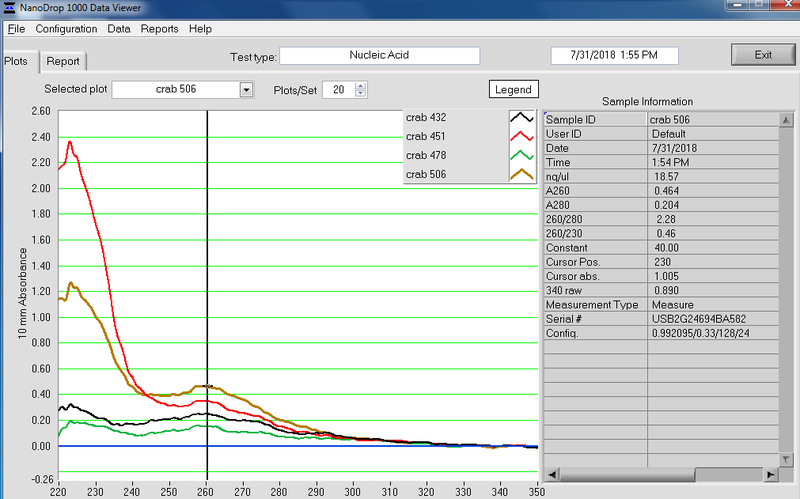 Tanner crab RNA has proved a bit troublesome. As such, Steven asked me to try isolating some RNA using the RNeasy Plus Mini Kit (Qiagen) to see how things would turn out. RNA was isolated according to the manufacturer’s protocol – following guideline for samples with < 1 x 106 cells. 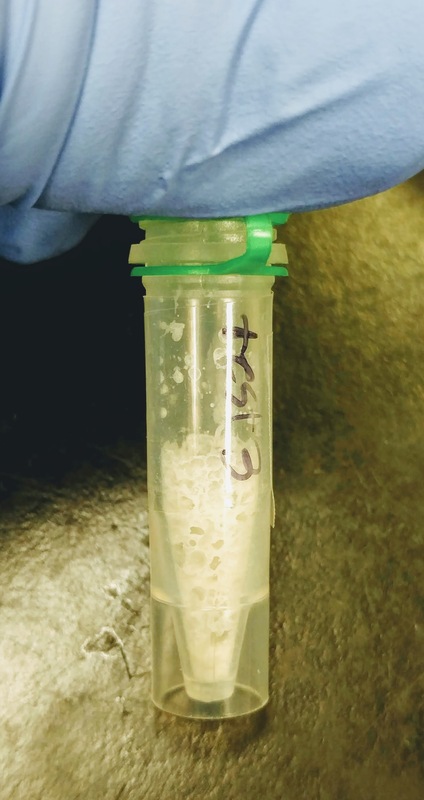 A solid precipitate formed in each of the tubes that could not be dispersed – it actually looked like a small piece of paper was now present in each tube. Samples were spun and the supernatant was utilized (this was the normal progression of the protocol, regardless of this precipitate forming). Samples were also assessed with the Roberts Lab NandoDrop1000. Samples were recovered from the pedestal after measurement. Overall, the isolation looks pretty good. The purity looks good (NanoDrop 260/280 ratios) and the absorbance peak at 260nm is exactly where we would want/expect it to be. The yields (according to the Qubit) are OK. They range from ~37ng – 350ng. The important part is that this method produced clean RNA, which means the quantification is believable. I think Grace’s earlier RNA isolations using RNAzol RT had too much contamination carried over, leading to incorrect quantification measurements. Going forward, I think we need to use some sort of isolation kit, however, we will be testing out good, old TriReagent as well. This entry was posted in Miscellaneous and tagged Chionoecetes bairdi, hemolymph, NanoDrop1000, Qubit 3.0, Qubit RNA HS, RNA, RNA isolation, RNeasy Plus Mini, tanner crab on 31 July, 2018 by kubu4. Grace had previously pooled a set of crab RNA in preparation for RNAseq. Yesterday, we/she concentrated the samples and then quantified them. Unfortunately, Qubit results were not good (concentrations were far below the expected 20ng/uL) and the NanoDrop1000 results yielded awful looking curves. In an attempt to figure out what was wrong, I decided to use the RNeasy Plus Mini Kit (Qiagen) on the three pools. I did this due to the poor spec curves seen in the NanoDrop1000 measurements. Additionally, all of the RNA pools had undissolved/insoluble bits floating around in them. My thinking was that excess contaminants/salts could be interfering with the Qubit assay. Removing these could/should enlighten us as to what the issue might be. Followed the manufacturer’s protocol for RNeasy MiniElute Cleanup Kit (as the RNeasy Plus Mini Kit uses the same reagents/columns for RNA purification) for samples with <100uL. Samples were quantified on the RobertsLab NanoDrop1000 (ThermoFisher) and the Qubit 3.0 (ThermoFisher) using the RNA high sensitivity (HS) Kit. Used 1uL of each sample. The NanoDrop did not detect any RNA in the samples. The Qubit did not detect any RNA in Crab Pool 1. The other two samples had similar concentrations (~7ng/uL). This would mean a total of ~84ng of RNA was present in each of those two samples. All pools were expected to have well over 1000ng of RNA. This entry was posted in Tanner Crab RNAseq and tagged NanoDrop1000, Qubit 3.0, Qubit RNA HS, RNA, RNeasy MiniElute Cleanup Kit, RNeasy Plus Mini, tanner crab on 19 July, 2018 by kubu4. We used a free Nextera DNA Flex Kit (Illumina) that we won in a contest held by Illumina! PCR steps performed in 200uL thin-walled PCR tubes. Magnetic separations were performed in 1.7mL snap cap tubes. See the Library Calcs sheet (link below) for original sample names and subsequent library sample names. The sheet also contains the indexes used for each library. This info will be necessary for sequencing facility. After library construction was completed, individual libraries were quantified on the Roberts Lab Qubit 3.0 (Invitrogen) with the Qubit 1x dsDNA HS Assay Kit. 2uL of each sample was used for each assay. Library quality was assessed using the Seeb Lab 2100 Bioanalyzer (Agilent) with a High Sensitivity DNA Kit, using 1uL of each sample. All libraries have DNA in them, so that’s good! Except for one library (Library Geoduck MG #04 is bad), the other libraries look OK (i.e. not great). Compared to the example on Pg. 12 in the manual, these libraries all have some extra high molecular weight stuff. When selecting the range listed in the Nextera Kit manual, the average fragment size is ~530bp – the expected size should be ~600bp. Spoke with Steven about Library Geoduck MG #04 and we’ve opted to just leave it out. 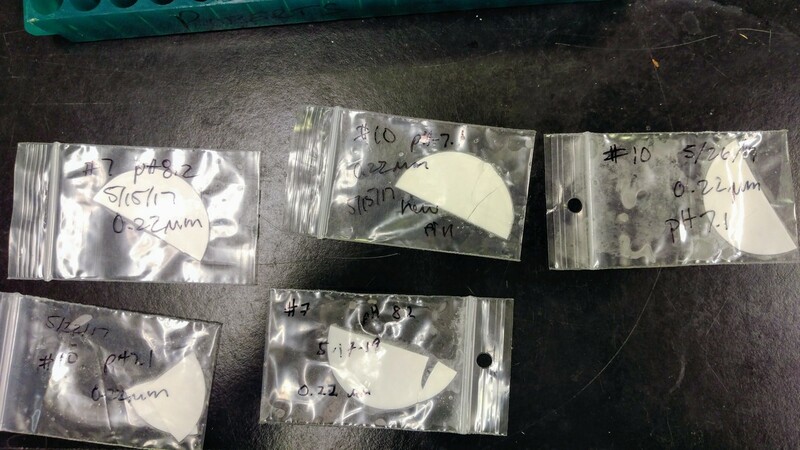 All other samples were pooled into a single samples according to the manufacturer’s protocol. This pooled sample was stored in the same -20C box as above, in position I4. After some confusion with the sequencing facility, I contacted Illumina regarding adapter sequences. I used the sequences provided for the Nextera DNA 24 CD Indexes (which was the index kit we used) on p.18 of the Illumina Index Adapter Pooling Guide. As it turns out, these sequences are incorrect. The correct sequences are on p.12 of that document (the Nextera DNA 96 CD Indexes). I’ve updated the Google Sheet (linked above) to reflect the correct index sequences. Email from Illumina is below. Even though he specifically references the H705 adapter, the correct sequence information for all i7 index adapters is found on p.12. H705 “AGGAGTCC” (Bases in Adapter) and “GGACTCCT” (bases for sample sheet. This is also consistent with the Illumina Adapters letter. We have provided this feed back to our colleagues to update the document so that all the information is consistent. Thanks for your patience and understanding while we evaluated this issue. If we do have any other questions or concerns, please let us know and we would be happy to discuss this further. This entry was posted in Miscellaneous and tagged bioanalyzer, geoduck, library prep, metagenomics, nextera, Panopea generosa, Qubit 1x dsDNA HS Assay Kit, Qubit 3.0 on 6 June, 2018 by kubu4. After discussing the preliminary DNA isolation attemp with Steven & Emma, we decided to proceed with DNA isolations on the remaining 0.22μm filters. Samples were quantified with the Roberts Lab Qubit 3.0 and the Qubit 1x dsDNA HS Assay Kit. Used 5μL of each sample for measurement (see Results for update). This entry was posted in Miscellaneous and tagged DNA Isolation, DNeasy, filter, geoduck, metagenomics, Panopea generosa, Qubit 1x dsDNA HS Assay Kit, Qubit 3.0 on 26 April, 2018 by kubu4.